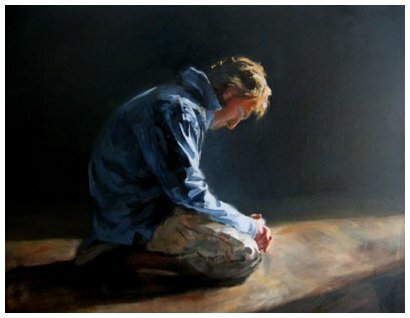 At this point, we enter a new phase in the unfolding drama, as John is caught up to heaven and granted privileged access to the heavenly throne-room. This vision (which continues into chapter 5) inaugurates the opening of the seven seals (6:1-8:1), just as the vision of the exalted Christ in chapter 1 introduced the seven messages. Thus 4:1-8:1 forms the second great cycle of sevens in Revelation. But it is no less crucial for understanding the remaining visions of the book, acting as the orienting vision for the whole of chapters 4-22. In these remaining chapters, a kaleidoscope of images and symbols will flash before the mind’s eye, presenting from different perspectives the character of the battle described in the preceding seven messages. Revelation 4-5 provides as it were the appropriate perspective from which to view and make sense of what is happening on earth. Here is a drawing back of the curtain which normally restricts humanity’s view of the heavenly realm. 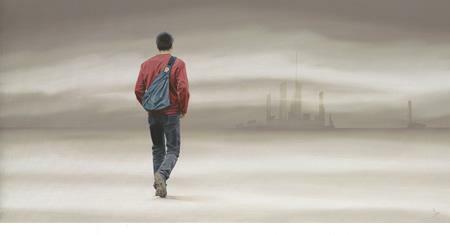 John, and those privileged to hear his Apocalypse, are enabled to see the world in a radically new light. After this I looked, and there in heaven a door stood open! And the first voice, which I had heard speaking to me like a trumpet, said, “Come up here, and I will show you what must take place after this.” 2 At once I was in the spirit, and there in heaven stood a throne, with one seated on the throne! 3 And the one seated there looks like jasper and carnelian, and around the throne is a rainbow that looks like an emerald. 4 Around the throne are twenty-four thrones, and seated on the thrones are twenty-four elders, dressed in white robes, with golden crowns on their heads. 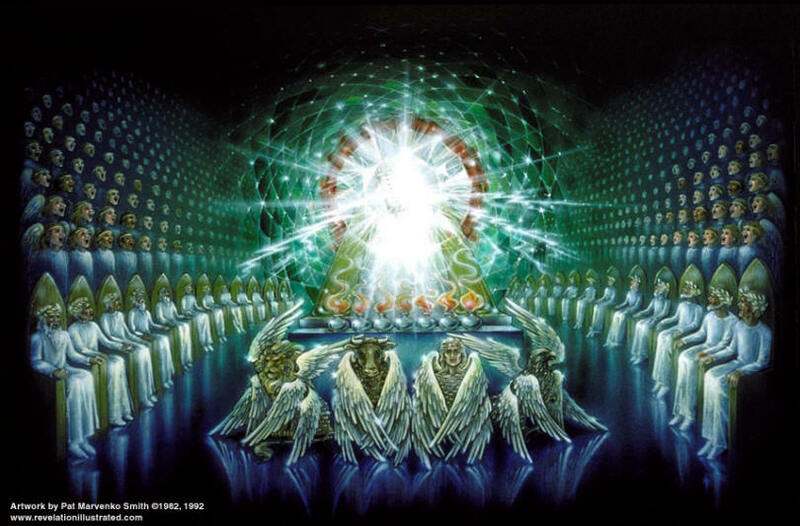 5 Coming from the throne are flashes of lightning, and rumblings and peals of thunder, and in front of the throne burn seven flaming torches, which are the seven spirits of God; 6 and in front of the throne there is something like a sea of glass, like crystal. “A door stood open.” Heaven is where God is acknowledged as King, and where true worship occurs. But far from being separated from this world, it is intimately connected to it, for what is seen in heaven either has been or will be played out on earth. Doors into heaven can be opened wherever God’s people are, though particularly when they are gathered for the eucharistic liturgy (3:20). Heaven is never far away, for those with the eyes to see. HERE is “Revelation Song” performed by Phillips, Craig and Dean. Let’s worship “with all the company of heaven” as we listen. 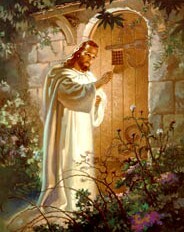 This painting of Christ knocking on the door (Rev. 3:20), by Walter Sallman, hung in the living room of my house as I was growing up. My Mother made sure we children saw that there was no knob — the door had to be opened to Christ from the inside. 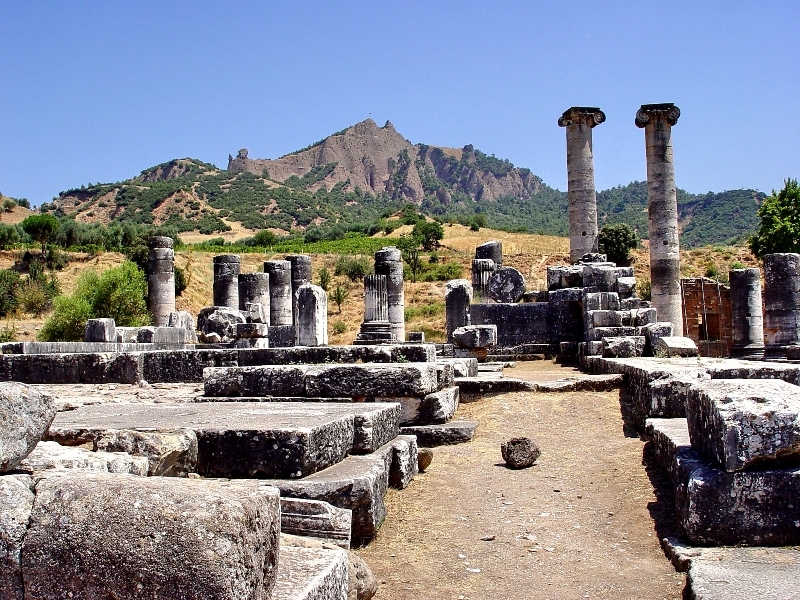 Sardis was formerly the capital of the ancient Lydian Kingdom. The wealth of Lydia and Sardis is legendary. The Pactolus River there was said to have become rich in gold when the fabled King Midas of Phrygia bathed in its headwaters to rid himself of the “golden touch.” The legend of the “Golden Fleece” supposedly originated from the method of laying sheep skins in the shallows of the Pactolus to collect gold particles. The expression “rich as Croesus,” the last Lydian king, is used to indicate an extremely wealthy person. Unsurprisingly, it was here in Sardis that coined money was invented. 2 Wake up, and strengthen what remains and is on the point of death, for I have not found your works perfect in the sight of my God. 3 Remember then what you received and heard; obey it, and repent. What to do with a dying church? Jesus did not instruct Smyrna to go to a church growth conference in Philippi. He did tell them to remember what they had seen and heard. What they had heard was the basic message of the apostles. Jesus calls them back to the basics. When Vince Lombardi tried to wake up his sleeping Green Bay Packers football team he called them back to the basics. He knew they needed to focus on the football basics of blocking and tackling. He took it to an extreme, held up a football and said: Gentlemen this is a football. George Barna in his book Turnaround Churches profiles thirty churches that were about to die and made a turnaround. What he found in his study was that those churches that did turn about got back to the basics. The return to basic theology and simple ministry was refreshing for most people, even those who had been Christian for decades. The people could agree on the crux of their faith. They were returning to what is eternally significant, practical and encouraging. If you do not wake up, I will come like a thief, and you will not know at what hour I will come to you.4 Yet you have still a few persons in Sardis who have not soiled their clothes; they will walk with me, dressed in white, for they are worthy. 5 If you conquer, you will be clothed like them in white robes, and I will not blot your name out of the book of life; I will confess your name before my Father and before his angels. 6 Let anyone who has an ear listen to what the Spirit is saying to the churches. 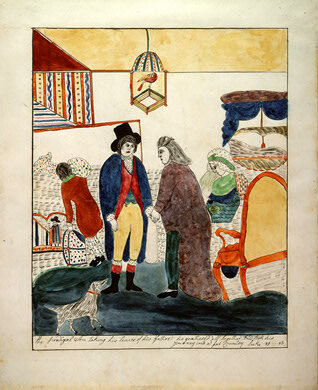 Philadelphia had been built with the deliberate intention that it might become a missionary city. Beyond Philadelphia lay the wilds of Phrygia and the barbarous tribes; and it was intended that the function of Philadelphia should be to spread the Greek language, the Greek way of life, the Greek civilization, throughout the regions beyond. The only ancient remains in Philadelphia is the Church of St. John, which dates from about A.D. 600. It was a huge domed basilica, but today all you see are the massive columns that held up the structure (pictured above.). 8 “I know your works. Look, I have set before you an open door, which no one is able to shut. Now Jesus opened the door for the Christians of Philadelphia to spread the culture of His kingdom through the whole region. I know that you have but little power, and yet you have kept my word and have not denied my name. 9 I will make those of the synagogue of Satan who say that they are Jews and are not, but are lying—I will make them come and bow down before your feet, and they will learn that I have loved you. 10 Because you have kept my word of patient endurance, I will keep you from the hour of trial that is coming on the whole world to test the inhabitants of the earth. In some ways, these features seem unspectacular. They should be commonplace among churches. Yet Jesus was completely pleased with this church. He had nothing negative to say to the church at Philadelphia. 11 I am coming soon; hold fast to what you have, so that no one may seize your crown. 12 If you conquer, I will make you a pillar in the temple of my God; you will never go out of it. I will write on you the name of my God, and the name of the city of my God, the new Jerusalem that comes down from my God out of heaven, and my own new name. 13 Let anyone who has an ear listen to what the Spirit is saying to the churches. When I lived in Turkey I visited all the sites of the Seven Churches of the Revelation, and Laodicea is the one I remember most clearly! Pictured above is the nearby town of Pamukkale (meaning “cotton castles” in Turkish), with its white terraces of white calcite travertine, a sedimentary rock left behind from the flowing thermal water. 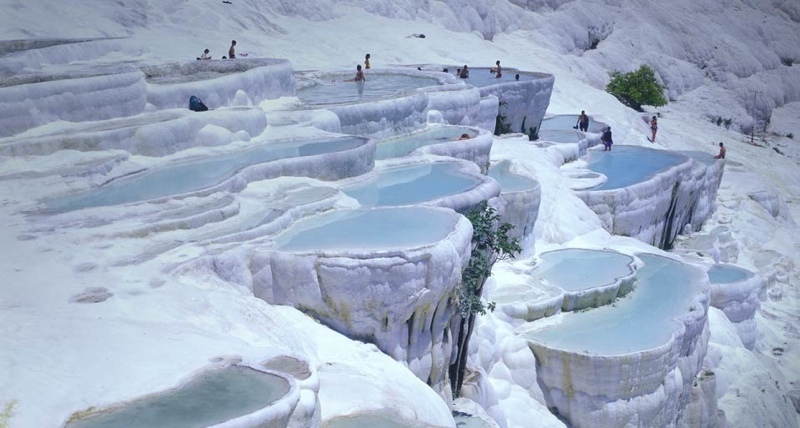 These are hot springs, ranging in temperature from 95 to 212 degrees F. It is stunning. 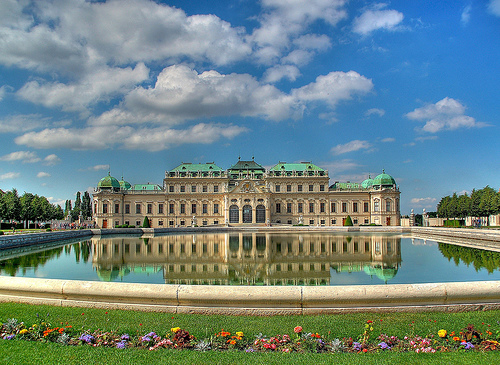 This place has been a resort for the rich and famous since Roman times. So, for the Laodiceans to be told that you are only lukewarm, when you live next door to hot springs . . ouch!
. . . meaning, the One whose word can be trusted. 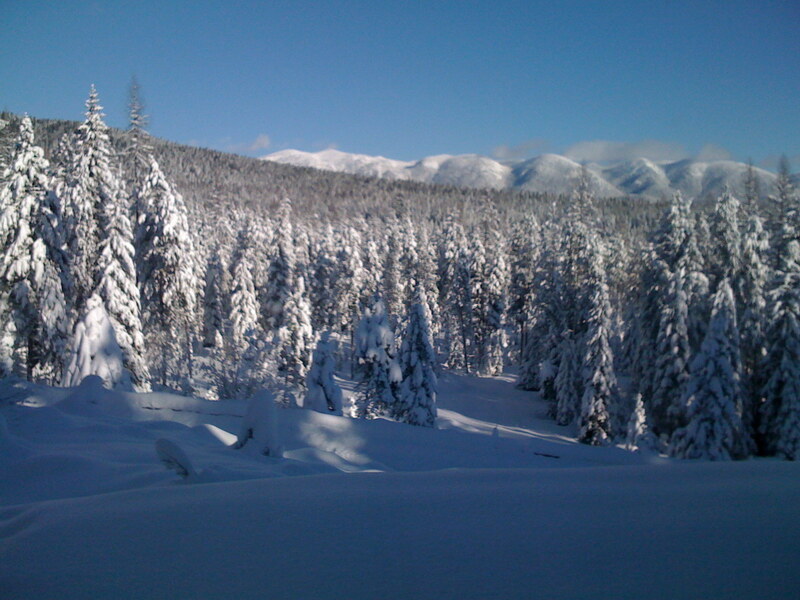 15 “I know your works; you are neither cold nor hot. I wish that you were either cold or hot. 16 So, because you are lukewarm, and neither cold nor hot, I am about to spit you out of my mouth. The angel is neither cold nor hot, but merely tepid. 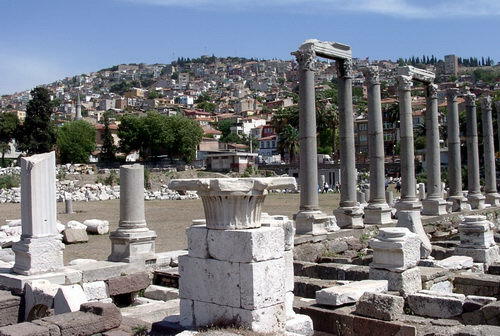 First-century Laodicean Christians would almost certainly pick up on the local allusion, for Laodicea was almost equidistant between Hierapolis (modern Pamukkale), with its hot thermal springs, and the cold-water springs of Colossae. 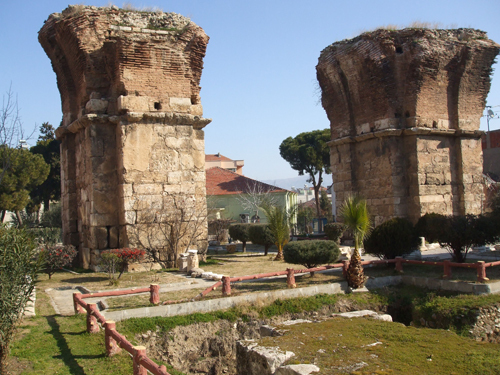 It was probably not the case that Laodicea’s aqueduct transported the hot water from Hierapolis to the north, as it comes into the city from the south. But certainly one can see clearly from Laodicea the sulphurous waters cascading over Hierapolis’ terraces, forming those white “cotton castles” which give the city its modern name. This local echo counts against the angel being criticized for spiritual lukewarmness, for loss of fervour (after all, surely it is better to be tepid in one’s commitment than completely cold). Rather, the tepid water of Laodicea does not produce any obvious benefit, unlike the healing properties of the hot baths at Hierapolis Spa or the refreshingly cool drinking water available to the Colossians (both of which are equally beneficial). The Laodicean angel has lost his effectiveness. Verse 20 — Behold I stand at the door and knock. HERE is “Somebody’s Knocking at Your Door,” sung by Franklin Willis and arranged by Robert Nathaniel Dett. 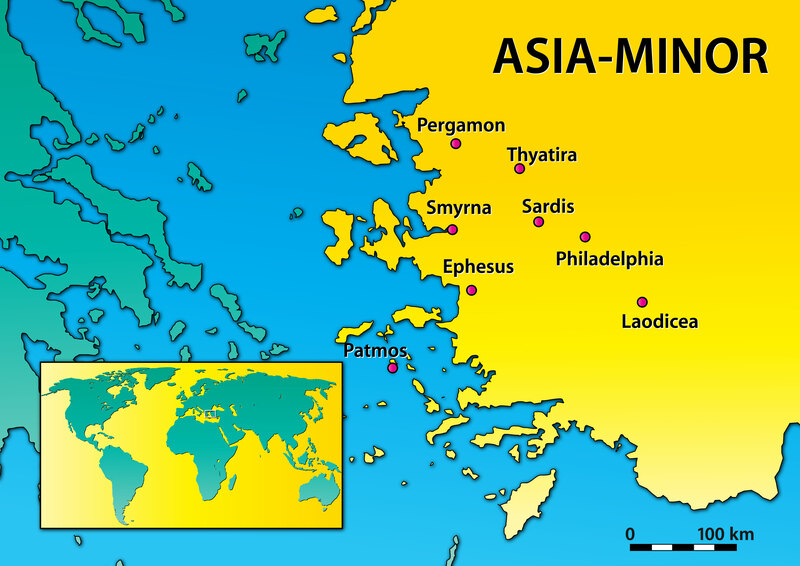 Asia Minor is a geographic region in the south-western part of Asia comprising most of what is present-day Turkey. We can see the state of each of these seven churches — and the state of our own walk with Jesus — by looking at what Jesus has to say to each church in each section. 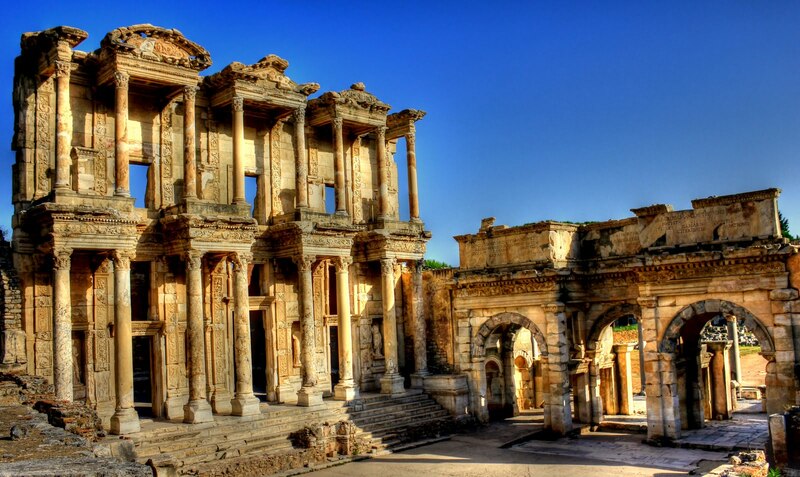 Ephesus was a prominent city in ancient Rome, with a famous church. Paul, Aquilla and Priscilla, and Timothy all ministered there. The city was also a religious center as home to one of the seven wonders of the world, the Temple of Diana, with its hedonistic worship. In addition, the temple served as a bank and treasury for individual merchants and even cities. The library, pictured above, was built to store 12,000 scrolls. 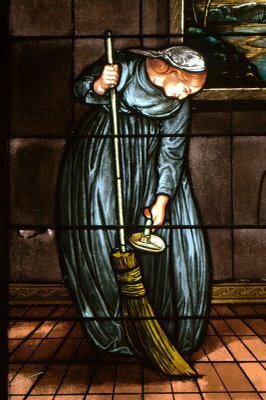 2 “I know your works, your toil and your patient endurance. I know that you cannot tolerate evildoers; you have tested those who claim to be apostles but are not, and have found them to be false. 3 I also know that you are enduring patiently and bearing up for the sake of my name, and that you have not grown weary. 4 But I have this against you, that you have abandoned the love you had at first. – I value praise from people more than praise from God. – I am callous in the way I treat a Christian brother/sister. – I choose not to witness because I fear rejection. – My leisure-time thoughts do not turn to God. – I do not cheerfully give to God’s work. – I become complacent to sin. – I hold grudges and am slow to forgive. 5 Remember then from what you have fallen; repent, and do the works you did at first. If not, I will come to you and remove your lampstand from its place, unless you repent. 6 Yet this is to your credit: you hate the works of the Nicolaitans, which I also hate. 7 Let anyone who has an ear listen to what the Spirit is saying to the churches. To everyone who conquers, I will give permission to eat from the tree of life that is in the paradise of God. The New Oxford Annotated Bible notes that the Nicolaitans taught that Christians were free to practice immorality in the name of religion. 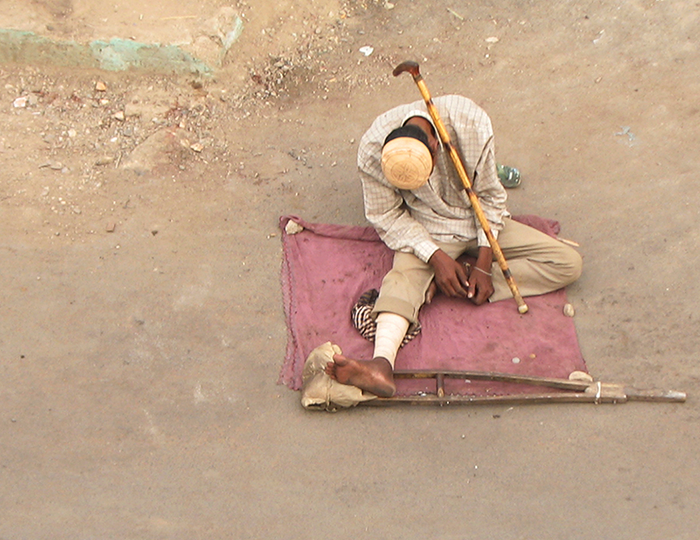 9 “I know your affliction and your poverty, even though you are rich. I know the slander on the part of those who say that they are Jews and are not, but are a synagogue of Satan. 10 Do not fear what you are about to suffer. Beware, the devil is about to throw some of you into prison so that you may be tested, and for ten days you will have affliction. Be faithful until death, and I will give you the crown of life. Jesus assures us, Let not your hearts be troubled. I go to prepare a place for you. I will give you a crown of life. 11 Let anyone who has an ear listen to what the Spirit is saying to the churches. Whoever conquers will not be harmed by the second death. 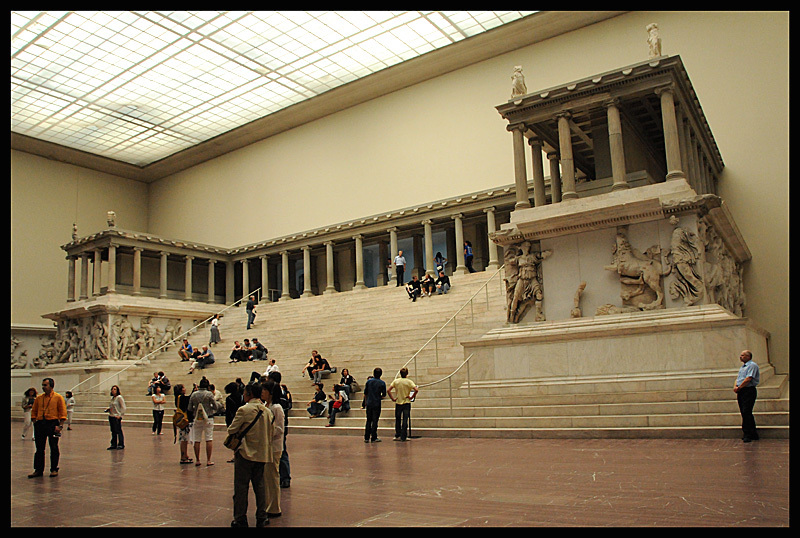 The huge Great Altar of Pergamon, with its monumental friezes, is in the Pergamon Museum, Berlin. The base of this altar remains on the upper part of the Acropolis of the ancient site. 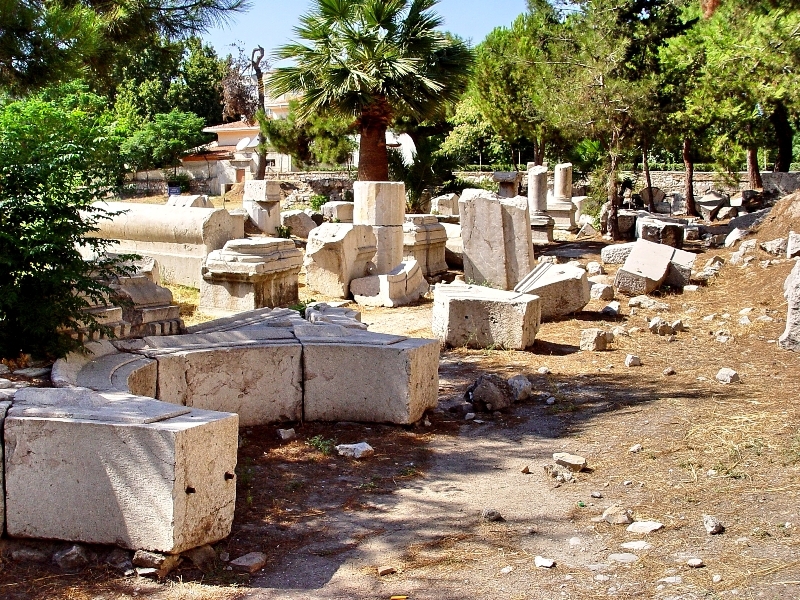 It is perhaps this altar, believed to be dedicated to Zeus, that John referred to as “Satan’s throne” in verse 13. 13 “I know where you are living, where Satan’s throne is. Yet you are holding fast to my name, and you did not deny your faith in me even in the days of Antipas my witness, my faithful one, who was killed among you, where Satan lives. 14 But I have a few things against you: you have some there who hold to the teaching of Balaam, who taught Balak to put a stumbling block before the people of Israel, so that they would eat food sacrificed to idols and practice fornication. Balaam was an ambiguous figure in the Jewish tradition, who blessed Israel with a messianic prophecy (Numbers 24:15-19, HERE), but was also held responsible for the apostasy of the Israelites at Peor (Numbers 31:15 HERE). Here is evoked that more negative tradition. 15 So you also have some who hold to the teaching of the Nicolaitans. 16 Repent then. If not, I will come to you soon and make war against them with the sword of my mouth. 17 Let anyone who has an ear listen to what the Spirit is saying to the churches. To everyone who conquers I will give some of the hidden manna, and I will give a white stone, and on the white stone is written a new name that no one knows except the one who receives it. Thyatira was a center of business and trade. It had many active trade guilds, each having their own patron deity from the Greek and Roman pantheon of gods. Acts 16:14-15 mentions Lydia of Thyatira, who was a seller of purple cloth from the city of Thyatira. Numerous references are found in secular literature of the period to the trade guilds which manufactured cloth. 19 “I know your works—your love, faith, service, and patient endurance. I know that your last works are greater than the first. Jesus commends them for wonderful qualities . . .
20 But I have this against you: you tolerate that woman Jezebel, who calls herself a prophet and is teaching and beguiling my servants to practice fornication and to eat food sacrificed to idols. 21 I gave her time to repent, but she refuses to repent of her fornication. 22 Beware, I am throwing her on a bed, and those who commit adultery with her I am throwing into great distress, unless they repent of her doings; 23 and I will strike her children dead. And all the churches will know that I am the one who searches minds and hearts, and I will give to each of you as your works deserve.
. . . but then calls them out for tolerating immorality in their midst. Jesus could not be more clear here! At Thyatira they were, with all their great qualities, turning a blind eye to immorality. But Jesus with his eyes of burning fire (v. 18) could not ignore immorality in the church. When it comes to immorality there comes a time when the church needs to be intolerant. Jesus commands it. Verse 4: But I have this against you, that you have abandoned the love you had at first. “You’ve Lost That Lovin’ Feelin’” is a 1964 song by The Righteous Brothers which became a number-one hit single in the United States and the United Kingdom the following year. In 1999, the performing-rights organization Broadcast Music, Inc. (BMI) ranked the song as having had more radio and television play in the United States than any other song during the 20th century. Additionally, the song was chosen as one of the Songs of the Century by RIAA (Recording Industry Association of America) and ranked #34 on the list of the 500 Greatest Songs of All Time by Rolling Stone. Bring back that lovin’ feelin’ HERE. Revelation! The book is full of visions, symbols, angels, monsters, and numerology. 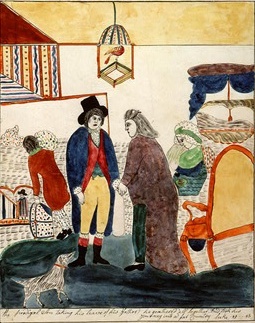 It has been described as an inspired picture-book, which, on account of its magnificent poetic imagery, makes a powerful appeal to the reader’s imagination. It presents the consummation of time and history toward which the entire Biblical narrative is focused. I do not begin to think that we can exhaust its riches in this study. But for the next 22 days, we will look at each chapter and listen to the Holy Spirit to point us to Christ, the One who is, and who was, and who is to come. 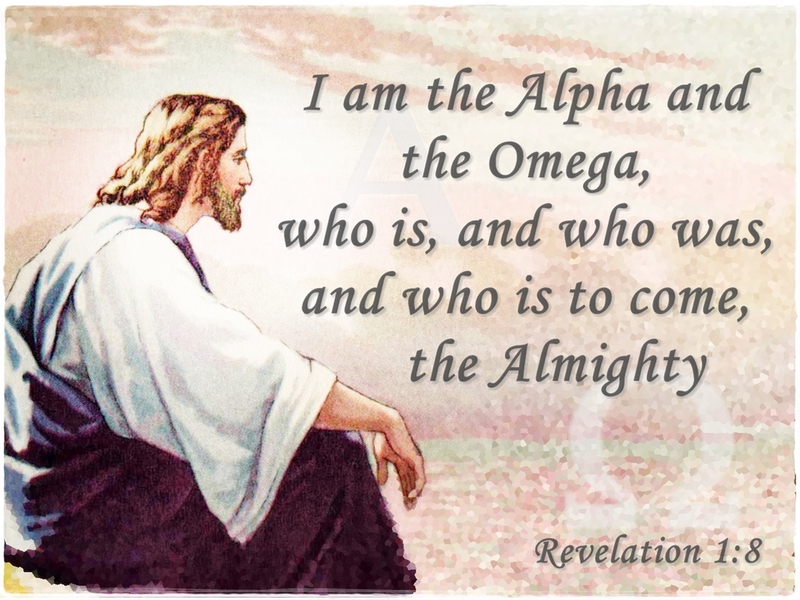 The ancient Greek word translated Revelation is apokalupsis (apocalypse). The word simply means “a revealing, an unveiling.” The Book of Revelation is the Revelation of Jesus Christ in the sense that it belongs to Him, He is the one doing the revealing. It is also Jesus’ Revelation in the sense that He is the object revealed; Jesus is the person revealed by the book. which God gave him to show his servants what must soon take place; he made it known by sending his angel to his servant John, 2 who testified to the word of God and to the testimony of Jesus Christ, even to all that he saw. 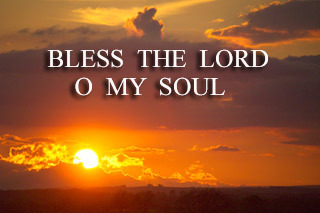 This is the first of seven beatitudes of Revelation. The Book of Revelation offers a particular and unique blessing to those who read and hear and keep the message of this book. The solemn words, the time is near, provide a motive for obedience. John’s readers, many of whom were, like him, Jewish Christians, would recognize this immediately as a reference to Exodus 3:14, where God is revealed to Moses as I AM WHO I AM, or I WILL BE WHAT I WILL BE. and from the seven spirits who are before his throne, 5 and from Jesus Christ, the faithful witness, the firstborn of the dead, and the ruler of the kings of the earth. He loves us continually . . .
. . . and he has freed us once for all. 6 and made us to be a kingdom, priests serving his God and Father, to him be glory and dominion forever and ever. Amen. 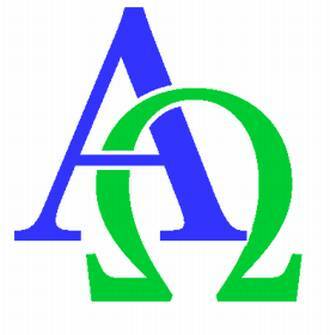 1) Alpha and Omega, the first and last letters of the Greek alphabet (like our “A to Z”); hence, the beginning and end of all things. 2) This great word Almighty is used ten times in the New Testament, and nine of the ten times are in the Book of Revelation. 9 I, John, your brother who share with you in Jesus the persecution and the kingdom and the patient endurance, was on the island called Patmos because of the word of God and the testimony of Jesus. The island of Patmos, in the Aegean, was like an Alcatraz Island in the Roman Empire. It was used as a prison island and functioned as a jail without bars. The island was rich in marble, and most of the prisoners were forced laborers in marble quarries. Patmos was a rocky, desolate island about 10 miles long and 6 miles wide. The ancient Christian historian Eusebius says John was imprisoned at Patmos under the reign of the Roman Emperor Domitian (A.D. 81-96). 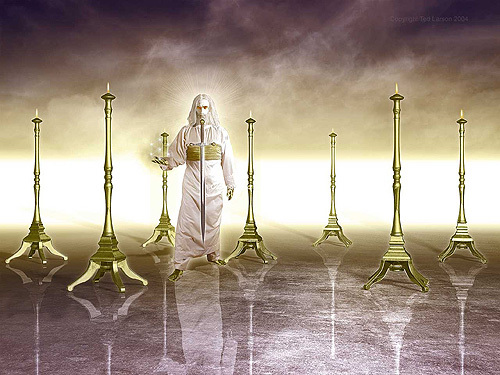 12 Then I turned to see whose voice it was that spoke to me, and on turning I saw seven golden lampstands, 13 and in the midst of the lampstands I saw one like the Son of Man, clothed with a long robe and with a golden sash across his chest. 14 His head and his hair were white as white wool, white as snow; his eyes were like a flame of fire, 15 his feet were like burnished bronze, refined as in a furnace, and his voice was like the sound of many waters. At times it is tempting to conclude, “If only I could have walked with Jesus, as the twelve disciples did, it would be so much easier to live the Christian life!” This thought reveals that we do not comprehend the greatness of the risen Christ we serve today. The Jesus of the Gospels is often portrayed as One who walked along the seashore, loving children and gently forgiving sinner. Yet the image of Jesus that we see at the close of the New Testament is far more dramatic! He stands in awesome power as He rules all creation. His appearance is so magnificent that when John, His beloved disciple, sees Him, he falls to the ground as though he were dead (Rev. 1:17). We grossly underestimate the God we serve! To ignore God’s word or to disobey a direct command from Him is to ignore the magnificent nature of Christ. Our fear of other people proves that we do not understand the awesome Lord who walks with us. He is vastly more awesome and powerful than the gentle rabbi we often imagine. 16 In his right hand he held seven stars, and from his mouth came a sharp, two-edged sword, and his face was like the sun shining with full force. 17 When I saw him, I fell at his feet as though dead. But he placed his right hand on me, saying, “Do not be afraid; I am the first and the last, 18 and the living one. I was dead, and see, I am alive forever and ever; and I have the keys of Death and of Hades. 19 Now write what you have seen, what is, and what is to take place after this. The Book of Revelation is arranged in this three-part structure. 20 As for the mystery of the seven stars that you saw in my right hand, and the seven golden lampstands: the seven stars are the angels of the seven churches, and the seven lampstands are the seven churches. “Miserere,” by Italian composer Gregorio Allegri (1582-1652), is a setting of Psalm 51 composed during the reign of Pope Urban VIII, probably during the 1630s, for use in the Sistine Chapel as part of the Tenebrae service on Wednesday and Friday of Holy Week. HERE it is, sung by The Choir of King’s College, Cambridge. This piece always brings tears to my eyes. How to confess our sins? 1) confession. No downplaying; David freely admits his sin. God is not interested in our excuses, but He is always willing to hear us say we are sorry for our sins. 2) contrition. David can’t stop thinking about his sin, or get away from it. Sin should bother us. 3) cleansing. Sin is a stain, an unseen poison. He needs the burden lifted. The only cure is the blood of Jesus. 4) consecration. David wants the joy of salvation again. To be consecrated is to be set apart for God’s work, and David is eager to tell others what God has done for him. Wait — but God had instructed the Israelites to bring him sacrifices and burnt offerings! So if that type of offering no longer works, then what? What can we bring to God as a sacrifice, which the Lord will deem acceptable and excellent? What does God want from us? 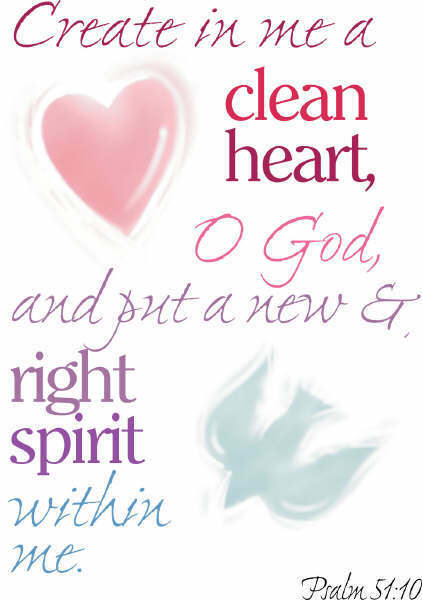 God asks that I bring him a broken heart, broken by my sorrowful awareness of my own sins and the sins of the world. “Have mercy on me, O God . . .” David begins his confession. 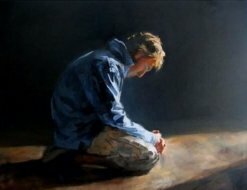 In doing so, he teaches us how to confess our own sins to the Lord. 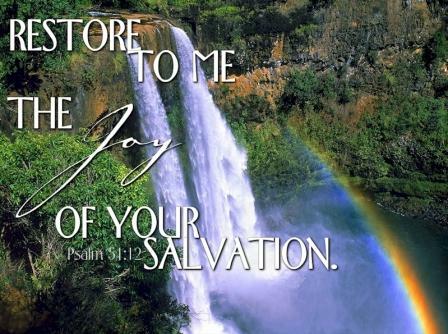 And the Lord has promised that our repentance will be met by his mercy. HERE is “Thy Mercy” sung by Sandra McCracken. Peter and John went to the Temple one afternoon to take part in the three o’clock prayer service. 2 As they approached the Temple, a man lame from birth was being carried in. Each day he was put beside the Temple gate, the one called the Beautiful Gate, so he could beg from the people going into the Temple. 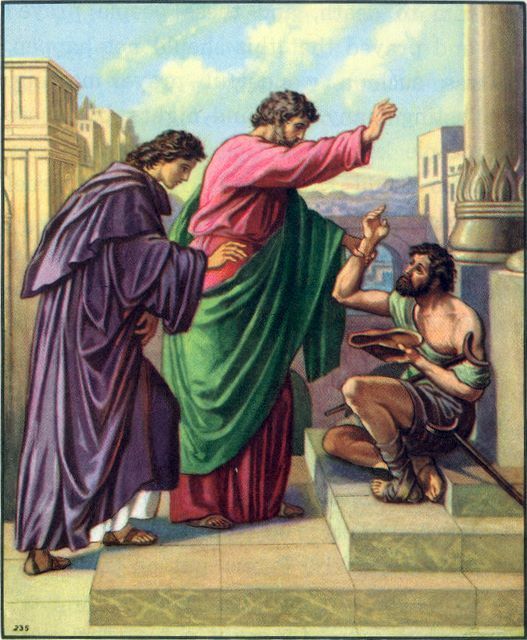 3 When he saw Peter and John about to enter, he asked them for some money.4 Peter and John looked at him intently, and Peter said, “Look at us!” 5 The lame man looked at them eagerly, expecting some money. 9 All the people saw him walking and heard him praising God. 10 When they realized he was the lame beggar they had seen so often at the Beautiful Gate, they were absolutely astounded! 11 They all rushed out in amazement to Solomon’s Colonnade, where the man was holding tightly to Peter and John. 12 Peter saw his opportunity and addressed the crowd. “People of Israel,” he said, “what is so surprising about this? And why stare at us as though we had made this man walk by our own power or godliness? 13 For it is the God of Abraham, Isaac, and Jacob—the God of all our ancestors—who has brought glory to his servant Jesus by doing this. Peter knows that simply seeing the miracle is not enough to bring the people to faith. As Paul says in Romans 10:17, “Faith comes by hearing, and hearing by the Word of God.” So Peter tells the story, the only story that can save lives. 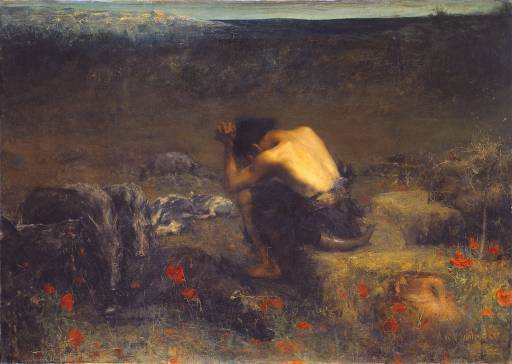 “The Lost Sheep” by Alford Usher Soord. 3Then Jesus told them this parable: 4“Suppose one of you has a hundred sheep and loses one of them. Does he not leave the ninety-nine in the open country and go after the lost sheep until he finds it? 5And when he finds it, he joyfully puts it on his shoulders 6and goes home. 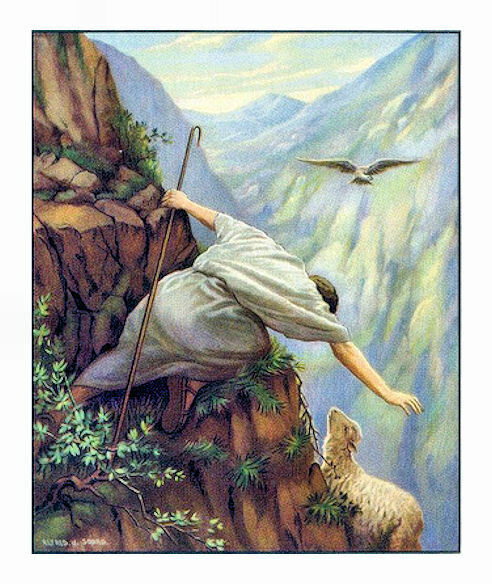 Then he calls his friends and neighbors together and says, ‘Rejoice with me; I have found my lost sheep.’ 7I tell you that in the same way there will be more rejoicing in heaven over one sinner who repents than over ninety-nine righteous persons who do not need to repent. 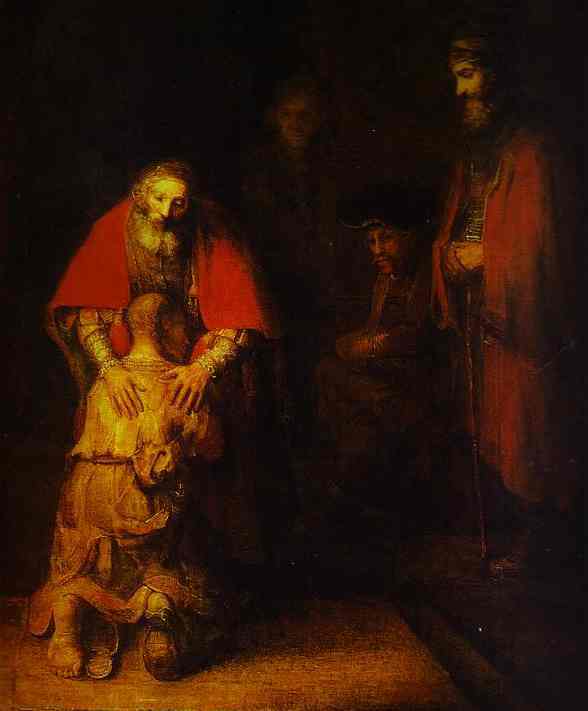 “Often I have asked friends to give me their first impression of Rembrandt’s Prodigal Son. Inevitably, they point to the wise old man who forgives his son: the benevolent patriarch. “The longer I look at ‘the patriarch’, the clearer it becomes to me that Rembrandt has done something quite different from letting God pose as the wise old head of a family. It all began with the hands. The two are quite different. The father’s left hand touching the son’s shoulder is strong and muscular. 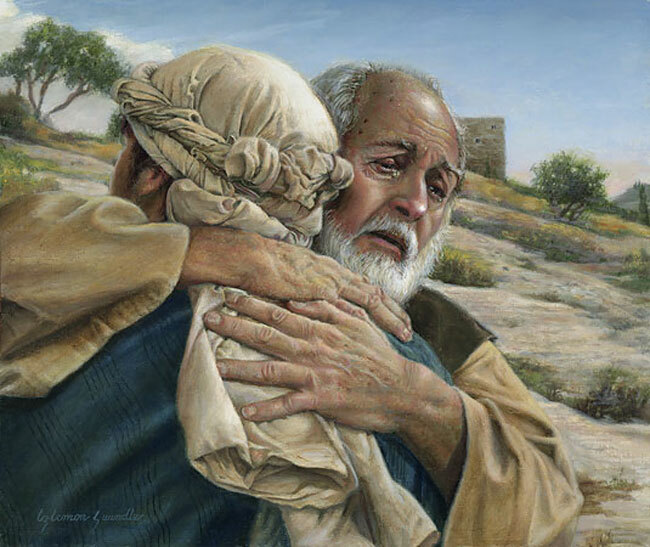 The fingers are spread out and cover a large part of the prodigal son’s shoulder and back. I can see a certain pressure, especially in the thumb. That hand seems not only to touch, but, with its strength, also to hold. Even though there is a gentleness in the way the father’s left hand touches his son, it is not without a firm grip. “How different is the father’s right hand! This hand does not hold or grasp. It is refined, soft, and very tender. The fingers are close to each other and they have an elegant quality. It lies gently upon the son’s shoulder. It wants to caress, to stroke, and to offer consolation and comfort. It is a mother’s hand…. 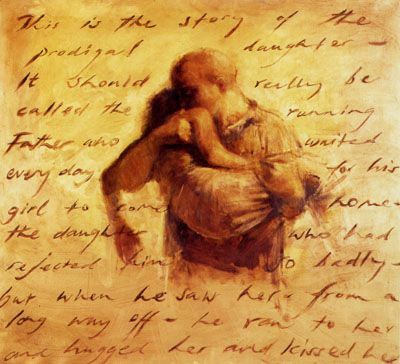 –from Henri J. M. Nouwen’s book The Return of the Prodigal Son: A Story of Homecoming, based on his contemplation of the painting by Rembrandt, above. Jesus came into our broken world to provide a way to get the prodigals back home. He wanted to purge the rebellion from our hearts so we would not only come home, but also enjoy being home, so we would rejoice in the privilege of being a part of the family we had abandoned. Jesus paid the price for our return and healing. As the years have passed, a conviction has deepened in my soul that Jesus wants to do far more for us than most of us imagine. So often we think in quite selfish terms about what Christ came to do. Yet in fact Christ died to do more for human beings than we have ever dreamed. If we do not dream a little bigger, we are never going to experience the deeper reality of his presence. The reality is that Christ came to do more than just keep us out of hell. He wants to develop a personal relationship with each human being for whom he died. He died to save me not just from my sins, but also from my own self. 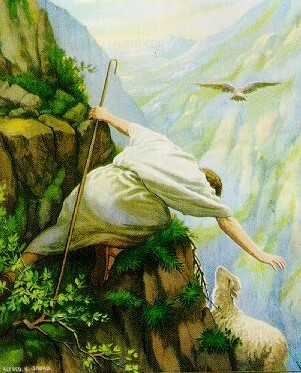 “We all, like sheep, have gone astray, each of us has turned to his own way” (Isaiah 53:6). Self-interest is the ultimate definition of sin, and the Cross holds the power to set each person free from self-interest. A French Catholic priest in the court of King Louis the XIV one day said, “Oh, God, isn’t there anybody left anywhere who loves you just for who you are? Can’t you find one such person? And if you can’t find one, couldn’t you make one?” That is why Jesus went to the Cross: to bring me to the place where I love him simply because of who he is and not because of what he can do for me. The ending of the story of the Prodigal Son would have been terribly disappointing if the son had merely returned for more of his inheritance without an apology to and an interest in his father. Once the father saw his son coming home, the relationship between father and son became the thing of paramount importance, and the reader forgets that the son ever needed anything except his father. Madrid is full of boys named Paco, which is the diminutive of the name Francisco, and there is a Madrid joke about a father who came to Madrid and inserted an advertisement in the personal columns of El Liberal which said: PACO MEET ME AT HOTEL MONTANA NOON TUESDAY ALL IS FORGIVEN PAPA” and how a squadron of Guardia Civil had to be called out to disperse the eight hundred young men who answered the advertisement.
. . . all seeking reconciliation with their fathers. You are currently browsing the DWELLING in the Word blog archives for July, 2014.